The rotor gesture supported by VoiceOver provides a quick way to adjust the speaking rate and change the language without having to go back to the Settings app each time a change is needed. 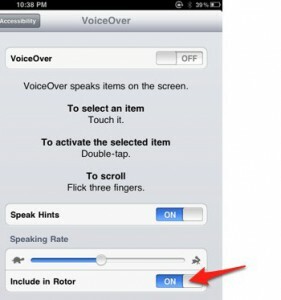 Tap the On/Off switch for Include in Rotor under Speaking Rate. To adjust the speaking rate with the rotor, turn the rotor until VoiceOver announces “Speech Rate.” The rotor gesture consists of placing your thumb and index fingers on the screen and turning an imaginary dial. 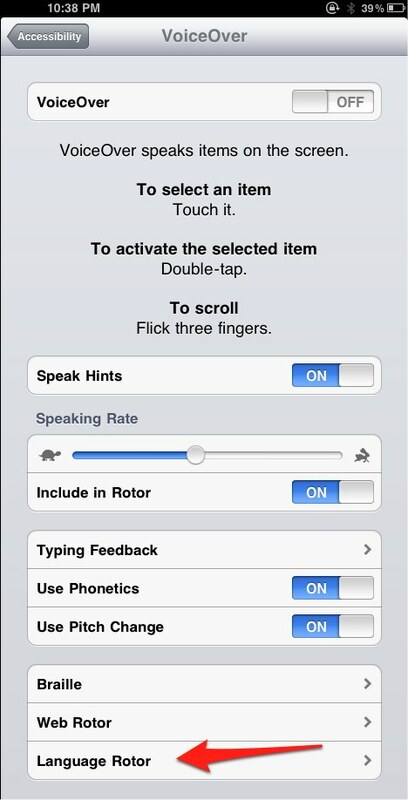 Once speech rate is selected in the rotor, flick up to make VoiceOver speak faster or flick down to slow it down. 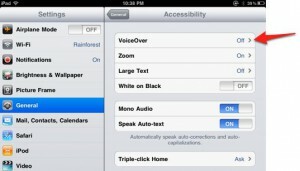 Open the Settings app and choose General, Accessibility, VoiceOver. 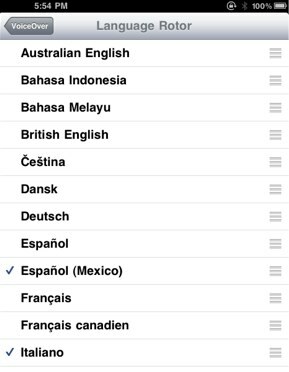 Tap the name of each language you wish to include in the rotor. To switch to a different language while VoiceOver is on, turn the rotor until VoiceOver announces “Language,” then flick up or down to select the desired language.